It is common knowledge that Thai education system is ranked among one of the worst in ASEAN. If you are fed up and want to do something about it, this workshop is for you. We invite you to come learn more in depth about Thailand's education problem and how to be part of the solution. 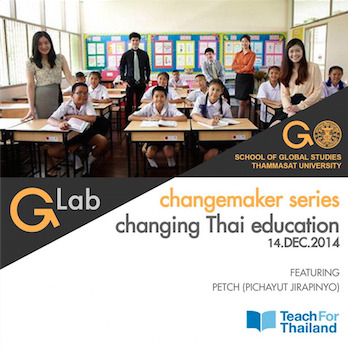 Thammasat University's Social Innovation Lab or GLab, is launching a series of Changemaker workshops for high school students. Our first theme is Education and we are featuring "Teach for Thailand", a non-profit organization that aims to better Thailand's education inequality, to talk to us about real problems on the ground. At the workshop, you will learn to really understand the problem and be challenged to brainstorm creative solutions to Thailand's education dilemma through a unique process called "Design Thinking" which we brought all the way from Stanford University. You solutions will be given to Teach for Thailand to be possibly implemented.